UPDATE: The Cow Illuminator has now sold out. Further stock is expected within the following month but keep an eye on our updates and more information will be posted in due course. Now, babies eh? They’re all over the place; literally. They are literally all over the place because there’s so many of them. They don’t know what they’re doing, so they expect YOU to be able to work it out for them. Most people think babies are just plain lazy and there is some truth to that statement. Still, you can’t expect them to know great fashion when they see it. That’s why they come to you and that’s why you come to us. Here on the Beans Shopping Network we have a very limited run of exclusive baby items from the new ‘Kevindo Menendez’ baby line. The Menendez name has been bandied about quite a lot over the last twelve months. In fact, you can barely walk along the high street without seeing his face on a magazine or his viso/volto build into an impressive horticultural montage. Kevindo is such a recluse that many have questioned his very existence. We here at the Beans Shopping Network are therefore here to prove that he is very much a real person by offering you the chance to purchase some magnificent infant merchandise created using his inspirational drawings. 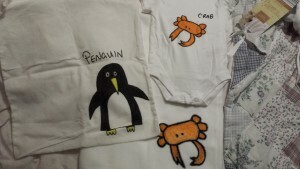 Not only do we have babygrows but we also have blankets and bags with those classic Menendez illustrations you instantly think of when someone mentions his name. You can be the envy of all your friends and enemies when you start flashing around these sweet babies. What is Shoshana in accounting going to think when she sees you swinging your brand new Penguin (TM) tote bag? How will Mitch, who walks your dog on a Wednesday, contain himself when he catches a glimpse of tiny babygrows adorned with the Crab (TM) visage? I’m not going to put words in your mouth but I can imagine that they will be cacking something into their newly washed undergarments. These are in such small supply that there’s a very good chance that before you’ve finished reading this article that we will have sold out. So don’t delay, pick up that phone and order fourteen as soon as you can. Between the babies, which are literally all over the place, and Kevindo Menendez’s face, which I can’t walk down the street without seeing everywhere, it’s surely only a matter of time before we start seeing babies literally everywhere that all have Menendez’s face. I for one fear this grim vision of the future. So basically what you’re trying to say is that essentially it’s all over for the world and anything non-Menendez. Yeah. There’s no hope for those of us who are neither a baby nor Kevindo himself. You’re not doomed, just as long as you purchase my new line of crab stickers and wear one at all times. Only £3.49 for 6! I’d be quite up for wearing a penguin one. Not even joking. I frigging love penguins. So Kev, you’re not selling ten for ten pound ten? An adult-sized penguin babygrow/onesie. I think that could work, it’s very marketable. What colour would you be looking for? Yeah, I can’t say that six for £3.49 is much of an offer. Everyone knows that ten for £10.10 is the optimal price point if you want to sell big. PS. Are there any plans to reintroduce the Cow Illuminator? I have a number of poorly-lit bovines and am looking for an affordable solution. You’re in luck. Some simple-minded fool has returned their bulk order of three so there are some back in stock. How many should I put you down for? How many cows can be simultaneously illuminated with each unit? Two max. Max of two. Max-two-vius. Hmmm. I might need four, but I’ll take the three you’ve got and I’ll make do with a torch for the seventh cow. Whatever you’ve got planned sounds immense. I’m jel/env I’m missing out on some barmy bovine action. Your cows will follow in the next 7 to 10 working days. Wait. I don’t want cows. I want cow illuminators. TOO LATE. You took a week to respond and now you have three more cows and I get to keep my cow illuminators. I’m going to throw these cows over the garden fence at you. I told you you’d regret living next door to me and this is where you get your comeuppance. When you look at the word ‘comeuppance’ it just looks wrong. Your comeuppance is going to be the wrongest thing that’s happened to you in a long time. I don’t know, there’s a lot of wrong things that have happened to me. I’m the wrongest of the wrong; look at my stretchy, fluffy pants!